The Playgirl Black Tafetta Underbust Cincher is a reasonability priced cincher that highlights your already flattering curves. While crafting your waist into a beautiful piece of trim, slim and flattened artwork, it will also improve your posture and provide excellent bust support. 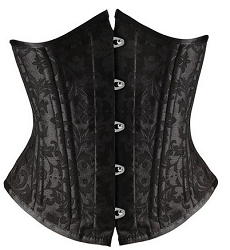 At 10 inches in the front and back, this corset is designed to really highlight your midsection. Handcrafted by expert corsetiere by Playgirl London, its tafetta outside can be worn on top or beneath clothing to give a real boost to any wearer's confidence. Its steel busk front closure, crafted from high-density European steel, adds an old school flare, while working hand in hand with its 10 steel bones (4 flat and 6 spiral), cotton lining and modesty panel. The strong laces for cinching are an excellent addition as well, especially if you plan to do any tightening by yourself. Though its clasps in the front are a beautiful addiction, Playgirl London sometimes has issues with their strength and durability. Most of the corsets from this designer will be replaced if you have issues with 30 days and you can exchange within 60. Because it is only 10 inches in the front and back, it may not be an ideal addition for women with longer torsos. If worn correctly, you may get spillage in your lower stomach. As always, many complaints stem from incorrect sizing. Be certain to measure appropriately and make any purchases based on your precise measurements. At its reasonable price, and knowing the expert craftsmanship that goes into each Playgirl corset, we recommend this product to nearly every woman and body shape (besides women who are very tall). If a tiny waist and smooth curves is what you seek, we would suggest considering this corset and most other cinchers from Playgirl.